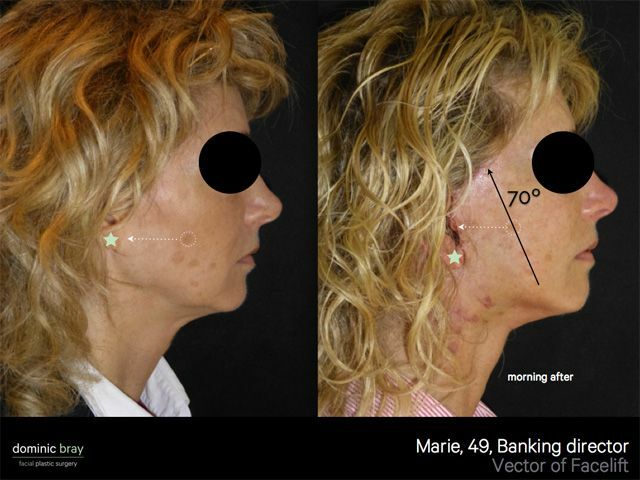 Marie is another fascinating case. 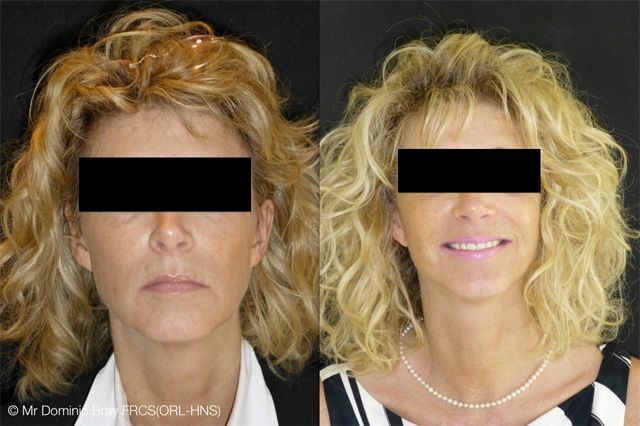 She is a classic example of somebody who didn’t ‘need’ a facelift, a notion that is commonly reinforced by the friends and family of all my patients under 50! She was already a beautiful woman, and I agreed, nobody NEEDS a facelift however was concerned that she was starting to lose her jawline and wanted to nip it in the bud! 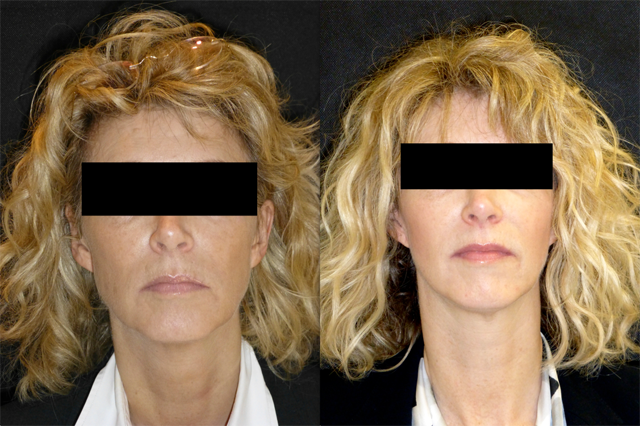 We undertook a day case local anaesthetic face and neck lift. Here is her journey. She has been anonymised at her request. 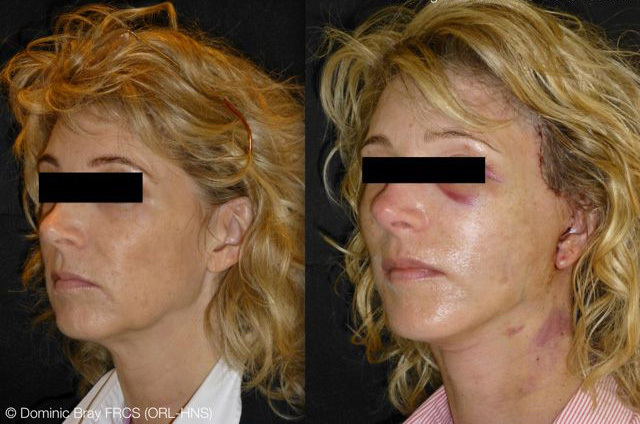 49 year old banking director with early descent of midfacial tissues the morning after a facelift and necklift performed under local anaesthetic without adrenaline and minimal sedation. 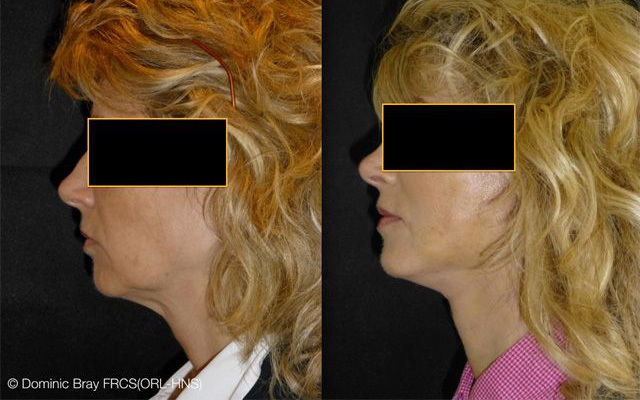 Despite the initial bruising caused by the witholding of adrenaline, her jawline, jowls and anterior neck already look rejuvenated. 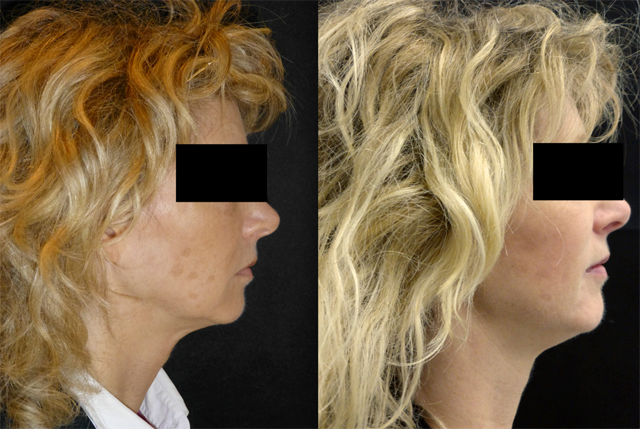 Her hair is washed and she has undergone lymphatic drainage and dermalux infrared light therapy to speed up the healing process. 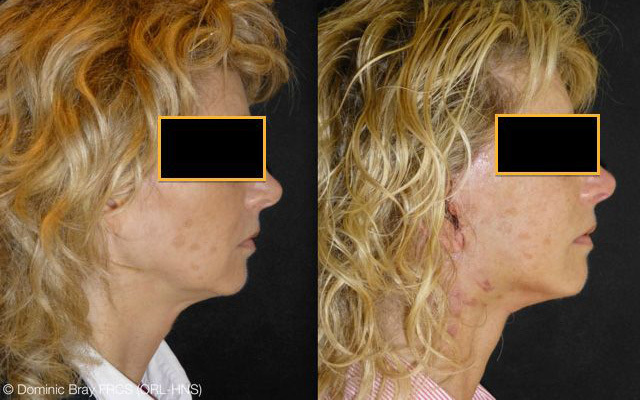 At 4 week review, Marie's scars are well healed, her skin in is great condition, and the middle and lower thirds of her face are completely rejuvenated. 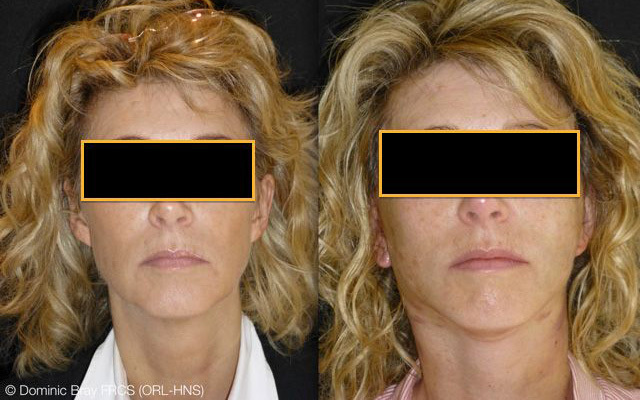 Friends, colleagues and family want to know her secret! 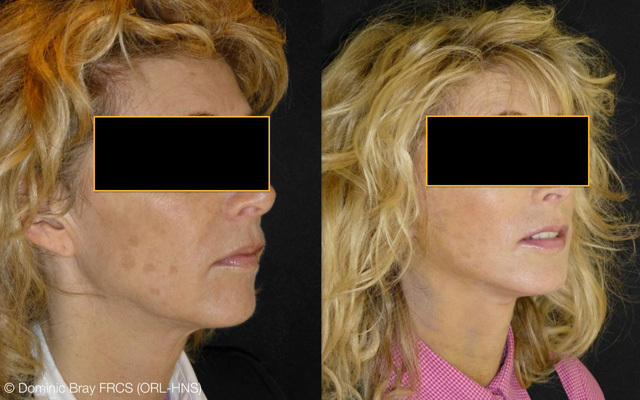 A couple of Laser resurfacing treatments and some wrinkle reducing injections will complete her program in the coming months. 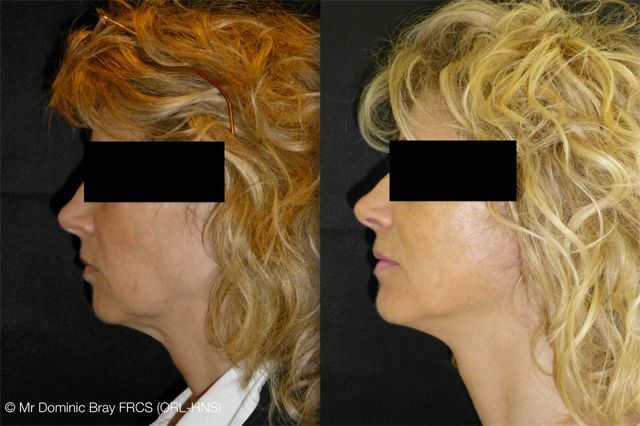 "this shot shows the upward direction of the facelift. 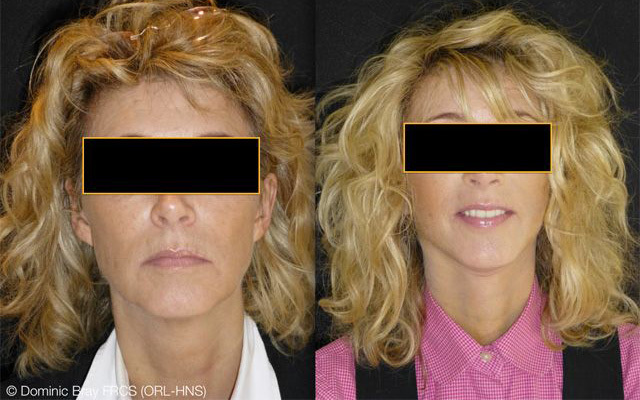 Traditionally, facelifting pulls the SMAS muscle layer backwards towards the ear which may result in a pulled or windswept look. 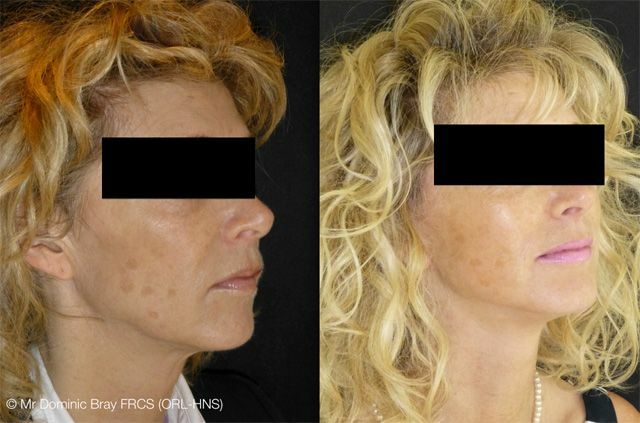 Marie has some Melasma (which can be removed with Laser!) 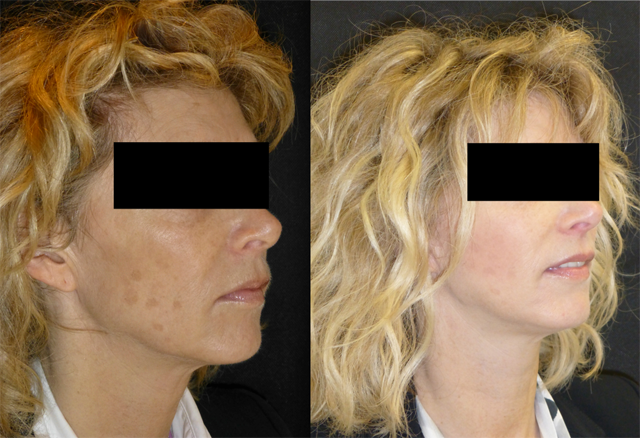 and their movement post surgery are a perfect demonstration of the SMAS lift direction / vector which is key to a natural result."